Need proof that the upcoming return of Capcom's long-running horror-action series aims to be the biggest, most ambitious entry in the series? Consider the fact that Resident Evil 6 will feature three separate storylines, each following a pair of characters. Players can control either Leon Kennedy and new government official agent Helena Harper, Jake Muller (the son of long-time RE arch-villain Albert Wesker) and Sherry Birkin, or Chris Redfield and BSAA sniper Piers Nivans, who is another new character. Each of the game's three campaigns on its own is about 70%-80% of RE5's total campaign. So, that covers the big part of RE6's aims. As for the ambitious part, that comes from a co-op play option that recalls Journey. Yes, that Journey. The silent, arty masterpiece that's become the best-selling PlayStation network game of all time. Is RE6 turning all metaphorical? Not quite. 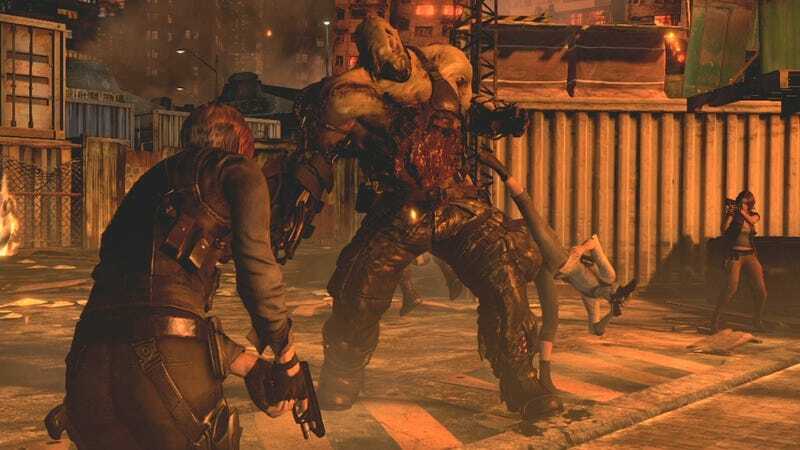 Today, Capcom showed how parts of RE6's three storylines can crossover with each other in different play sessions over the internet, dynamically changing the game from a two-player affair to four-player co-op. Say you're playing as Leon in your campaign. If you're at one of the title's crossover junctions, someone is else playing as Jake can jump in and play through the same point in the storyline. I saw this in action during one of the game's boss battles. A tense scene where Leon and Helena meet up with Jake and Sherry. They find themselves at cross-purposes but must team up when a new cyborg-zombie called an Ustanak attacks. After the cutscene, another player joined the battle helping to take down the powerful enemy. The sequence I saw wasn't scary at all but seemed faster than the combat in Resident Evil 5. Characters did running slides, switched weapons on the fly and swallowed healing herbs all while dodging and running in real time. In short, no more tank controls. In these crossover moments, partners will switch up, so Leon will pair with Sherry and Jake with Helena. Now, players will be able to control their matchmaking preferences so that only friends can jump in but you'd still need to sync your progress to reach a crossover moment at the same time. And even if you don't do that, you can opt out of getting a random match with a player from around the world and stick with an AI partner for these all-together-now moments. But, this idea of a sudden guest appearance by a live human player into another person's gameworld might remind other players of ThatGameCompany's experimental hit. It wasn't quiet, though, and was hardly meditative. Moreover, these crossover sequences will only happen at certain points. So, don't go into Resident Evil 6 thinking that you'll be getting visitors at every turn. There's going to be a small window where others can jump into your game to lend a hand. And from what I saw today, Resident Evil 6 players are definitely going to need to help each other out.